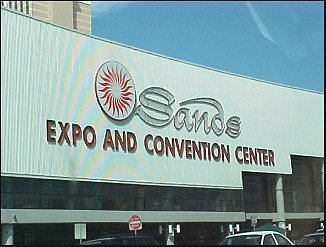 On June 3-5, I attended the JCK Las Vegas Show at the Sands Expo and Convention Center. This is the US version of the Basel Fair, though fewer of the major Swiss watch brands are represented. 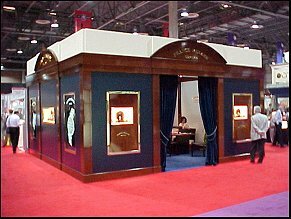 Unlike Basel, the JCK is not open to the general public, and even for those in the trade, securing admission can be a challenge, as only individuals in specific occupations are permitted to register. 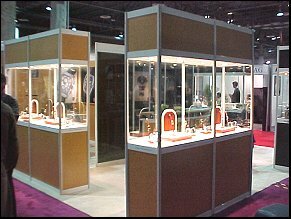 Manufacturers, distributors and wholesalers of all manner of watches and related merchandise exhibited. 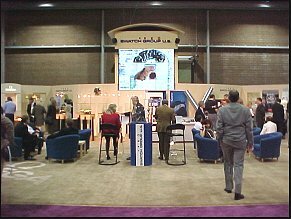 Watches are a relatively small part of the overall show, occupying only one corner of one room (though it is a very large room). The show also includes fine and designer jewelry, precious gemstones, and related merchandise. A partial roster of watch companies in attendance includes Swatch Group (Blancpain, Omega, Longines, Hamilton, Tissot, Rado), Franck Muller, Dubey & Schaldenbrand, Bell & Ross, Oris, Fortis, Ventura, Xemex, Jorg Hysek, Frédérique Constant, Maurice Lacroix, Hublot, Tutima, Kreiger, Invicta, Limes, Mühle Glashütte, Seiko, and Citizen. I understand that other brands such as Cartier attended, meeting buyers in private suites, not on the main floor. Also present were Underwood, Scatola and Oribta winder manufacturers, several strap and bracelet manufacturers, Witschi and other equipment and tool companies. The trends started in Basel continued at the JCK. Big is still in, with many companies showing models 40 mm and larger. Rubber straps are everywhere this year, and power reserves and oversized dates are the most popular complications. 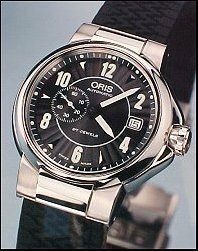 Steel continues to be the favorite metal, and many companies are adding precious stones, such as diamond bezels, to their steel watches. The brand extension trend continues unabated, with new watch lines being launched under names previously unrelated to wristwatches. 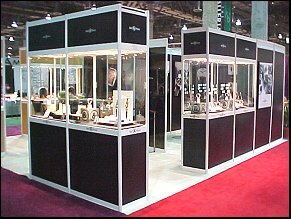 Examples at the JCK this year included “Cat”, named for the heavy equipment manufacturer Caterpillar, and Zippo, of cigarette lighter fame. Following on the heels of the Basel and SIHH shows, the JCK show suffers a bit when it comes to new product launches. 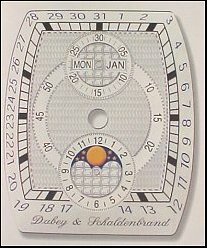 Dubey & Schaldenbrand was showing the Gran Chrono (below, left) and for the first time a prototype of the Gran Chrono Astro (dial drawing, below right). These are very attractive oversized watches in the Aerodyn style, though much wider. 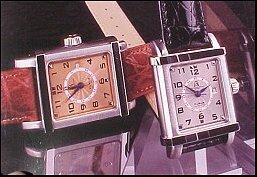 The Gran Chrono Astro case has a “double curvature” (top to bottom, side to side), and the prototype case took 16 months and over 90 operations to complete. Creating the guilloche dial requires 85 steps. 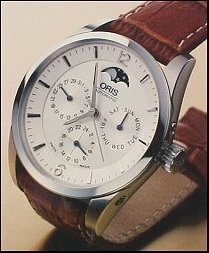 This watch has an automatic 25 jewel movement with double chronograph registers, day, date, month and moonphase, sapphire crystal, exhibition back. Suggested retail is $4900 on strap, $5250 on bracelet in steel. I also had a chance to examine the prototype for the Maurice Lacroix Calender Retrograde, a watch I saw only through a glass case in Basel. 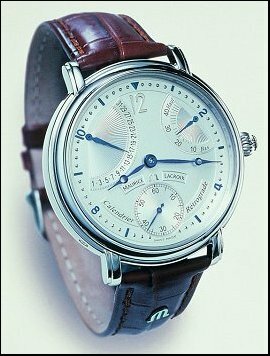 This is a very elegant and attractive watch. 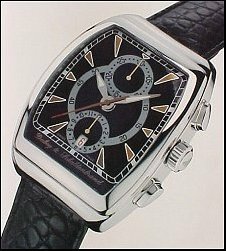 The ML rep said this watch should be in US stores in January, 2001, with a suggested retail price between $3500 and $4500. 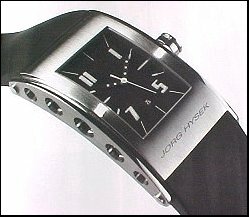 Jorg Hysek showed his line of sleek and stylish watches, featuring lovely, architectural cases. The case sides look like miniature structural steel, with gently curving shapes and weight-saving voids. These watches look and feel great on the wrist. 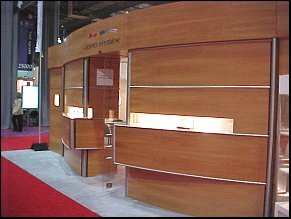 Hysek’s booth was perhaps the most stylish at the show, with the front of the booth tracing the same gentle curve as his watch cases. Above left, the Jorg Hysek booth. Above right, one of Hysek’s new models. Also on hand was Ventura, showing their V-matic Ego Chronograph and the new Futura automatic digital. The Ego Chronograph measures an impressive 43 mm in diameter, and features a hardened, scratch resistant titanium case with curved sapphire crystal. The movement is a heavily reworked and COSC-certified Valjoux 7750. The Futura uses an in-house proprietary movement said to be the first truly automatic digital watch. 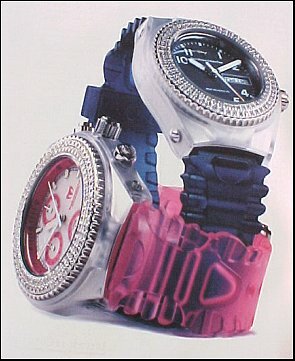 One product new to the US market is a unique line of “build it yourself” watches sold under the name WatchMaker. 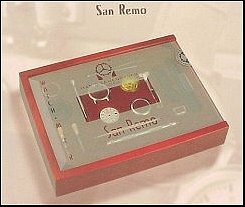 The upper end of the range includes 6 different watches that come partially disassembled in a very attractive glass-topped presentation/display box. The movements are all mechanical ETA, handwinding or automatic, calibers 2804, 2671 and 2824, and are fully assembled, save the winding crown and stem. 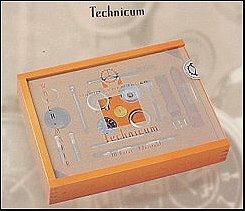 The rest of the kit contains the watch case (two pieces with screw in back), front and display back crystals, 2 dials of different colors, 2 sets of hands, straps, deployant and regular buckles, plus screws, screwdrivers, tweezers, a loupe, a hand setting and pulling tool, and a spring bar tool. This modular approach allows you to design and build your own watch in a relatively short amount of time, with no special watchmaking skills required. Of course, if you’ve taken the TZ Watchmaking School, you can disassemble these movements and then really build yourself a watch from scratch. Retail prices range from $595 up to $2250. 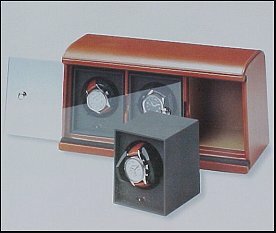 Another exciting product coming to the US is watch winders by Underwood. 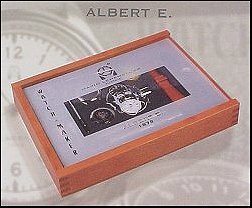 For years, watch owners have been faced with paying stiff prices to obtain attractive winders in leather or wood boxes. Underwood will likely shake things up a bit in the winder business. These winders are beautiful, and they start at $299 for a single winder model. 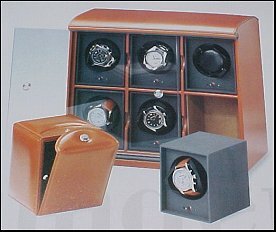 Also available are triple and 6 watch winders. Each winder holds the modular winders, which can be removed and carried individually when needed. Underwood generated some buzz at Basel, and their momentum continued in Las Vegas. Above left, Underwood single and six module winding boxes. Right, a three module box. 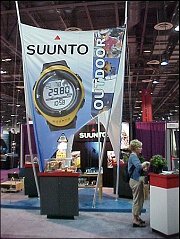 I also liked the newest “Wristtop Computers” by Suunto, a Finnish company that has been selling professional quality quartz multi-function watches for about 15 years. Two models in particular caught my eye. The first is the Stinger, a true professional dive computer. As a regular watch, the Stinger offers dual time zones, calender, alarm, and chronograph. As a dive computer, the Stinger offers separate Air, Nitrox and Free/Gauge modes. This means the information displayed is customized for breathing air, nitrox, technical gas or for free diving. 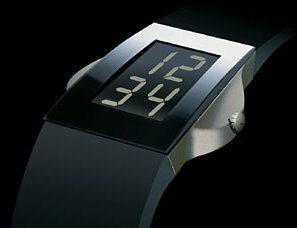 The watch also offers decompression calculations, automatic backlighting, personal and altitude adjustments, metric or imperial unit displays and a patented user-definable display. Of course this is a dive computer with a 36 hour memory with adjustable sampling intervals from 2 to 60 seconds. You can bookmark dive highlights and easily download data to your computer. Available on strap (110 g/3.9 oz) and stainless bracelet (186 g/6.6 oz). On top of all these features, the Stinger is a great looking watch. Unfortunately, a good quality Stinger image was not available at press time. 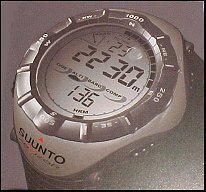 Another practical and good looking Suunto model is the X-Lander, which offers altimeter (9000 meter altitude range and logbook), temperature compensated barometer, compass, and wristwatch with 12/24 display, calender, 3 alarms, chronograph and countdown timer. These oversized watches are rugged, practical and good looking, and they may catch on with a broader audience. 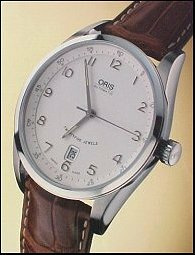 My choice for Best in Show would have to be Oris. 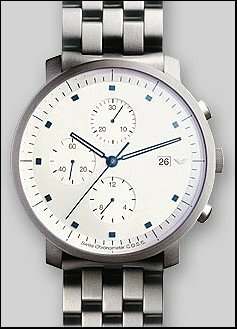 This company seems to be revamping almost its entire line in one season, introducing several new watches, most of which should be in US stores by the end of July or early August (scans below). The new Classic XXL, BC3 Chronograph and Full Steel CS are great looking watches. Also on tap is a dressier version of the world timer, on a strap. This watch is a real stunner, and I’m sorry to say no image was available at press time. 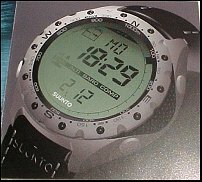 No report on the JCK would be complete without mentioning Techno-Marine, a company known until recently for relatively inexpensive quartz fashion watches with interchangeable brightly colored plastic straps. T-M is moving upscale with a line that sports small diamonds on the bezel, and they are selling like hot cakes. Many retailers report being unable to keep them in stock. 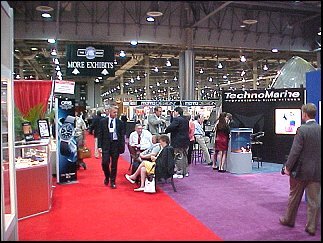 The small T-M stand (not large enough to be a booth) was almost always crowded, with eager buyers sometimes three deep trying to place orders, while techno-pop music blasted from a small boom box behind the stand. 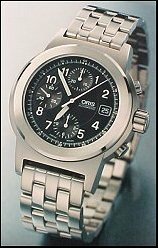 Though perhaps not of interest to most TZers, these T-Ms perpetuate the general public’s interest in wristwatches, which is good for the entire industry.